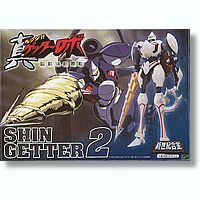 Shin Getter 2 on Sale! I've been seeing these Getter 2 toys on sale for the longest time at HLJ already. Months is more like it. And I'm definitely surprised that they are still on slashed/reduced prices. Must be an overstock or nobody is buying them... or worse, nobody knows that they are on sale! As a Getter fan, I just hate to see a good Getter sale passed up by other Getter fans. First is the Shin Seiki Gohkin Shin Getter 2 that was initially priced at 12800 yen, but is now going for only 3,840 yen. Then there is the Shin Seiki Gohkin Shin Getter 2 limited edition Weathering version that is going for 5,120. There is also the Black Edition Shin Seiki Gohkin Shin Getter 2 that is going for 6400 yen. If you like old school getter, there is the The Chogokin Getter 2 that's selling for only 600 yen. As a boy I remember trooping to the old video rental store during the summer to borrow Jim Terry's Force Five series in order to indulge in the Amercanized version of Japanese Giant Robots. They were all my favorites. From the Starvengers (Getter Robo G), Gaiking, Danguard Ace and most especially, UFO Grandizer.